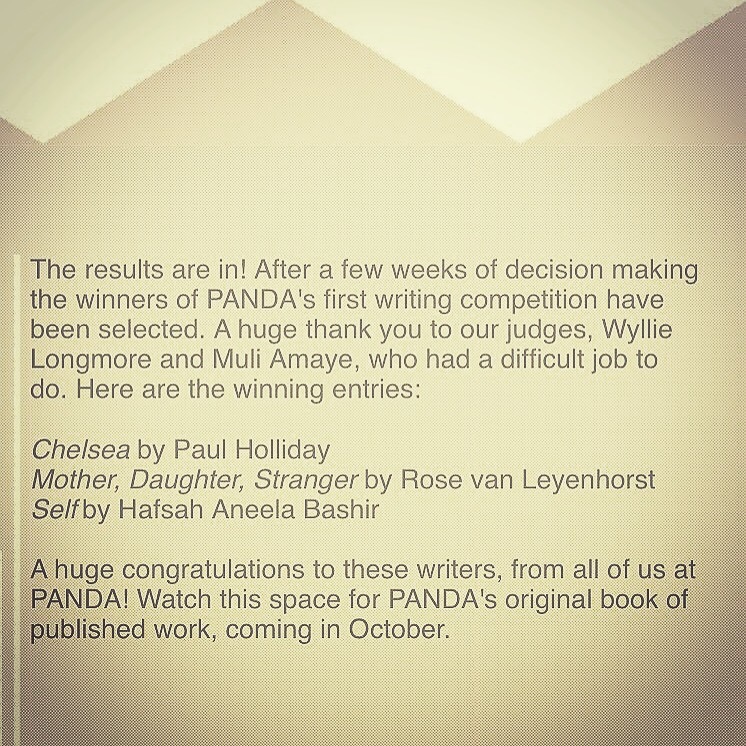 Winner of PANDA’s Writing Competition! ‘Congratulations! You have been picked by our judges as a winner of PANDA’s writing competition!’, was a great opening line to an email I received today. Apparently there were many strong entries and the judges felt that my piece, ‘Self’, had the most potential and showed creative excellence alongside ‘Chelsea’ by Paul Holliday and ‘Mother, Daughter, Stranger’ by Rose van Leyenhorst which I am looking forward to reading. So, what’s next? PANDA’s first book will be published in October and we writers will be published alongside each other, in a book of wisdom about the arts, created by PANDA and its members. I feel very happy I must say! This entry was posted in Uncategorized and tagged #flashfiction #writing #art #shortstory #writers #musings #muslimwriter, #PANDA on July 26, 2017 by Hafsah Aneela Bashir.